"Thank you for all that you do for us. We are blessed to have you as a friend, and to have the BOYS OF BASEBALL - NATIONAL TRAVEL TEAM in our own backyard. I have faith that my guys will be better people for having known you, your fellow coaches, players, and families." Just wanted to take a minute to say THANK YOU for giving William the opportunity to play with the BOYS OF BASEBALL - NATIONAL TRAVEL TEAM these past few years. He has really made some lasting friendships, and has had a great time along the way. He loves the game of baseball, and is really going to miss playing with your organization and its fine coaches. You have a diamond in the rough with Jimmy Kolaitis. He is a wonderful young man, and he has made a big impact on William's life these past few years. Thanks for sharing him with us. I have grown to love him like he is one of my own children. How could you not love Jimmy!? 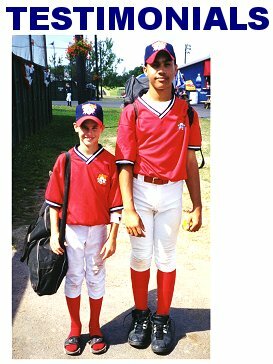 We cannot thank you and your fellow coaches (Allen Blackmon, Greg Avant, and Randy Lippincott) enough for including Adam in the Cooperstown Dreams Park week #11, 2007 (August 17-24). It was an AWESOME experience for him! We only regret that Eugene and I were not able to work it out to be a part of all the excitement. It was definitely a trip of a lifetime for Adam. He had a BLAST! We are planning on Adam playing with the BOB-NTT in Gainesville, FL late this fall. Again, we cannot fully express to you our gratitude for taking Adam "under your wing". We are very blessed and feel so fortunate that Adam has become a part of the BOYS OF BASEBALL - NATIONAL TRAVEL TEAM. We look forward to seeing you in Gainesville and beyond. Hakeem, I, and the rest of the Haynes Family totally enjoyed our Cooperstown Dreams Park NATC '07 experience (August 24-31). It was not at all what we expected...but, better. We will never forget you. You have no idea how much of a positive impact you and your fellow coaches (Scott "Bubba" Luke and Jimmy "Crack Corn" Kolaitis) made on Hakeem. Please don't forget us, and remember Clayton (currently age 8) is on his way, and hopefully a future BOB-NTT player. Seems likes just yesterday we were going on road trips to Cleveland, Panama City, Homestead, and Tennessee for baseball tournaments...it was great fun! I hope you were able to notice that Ehren made his major league baseball debut with the Chicago White Sox last night (July 20, 2007), pitching two-thirds of an inning to close out the 8th. Without the BOYS OF BASEBALL - NATIONAL TRAVEL TEAM, Ehren would never have had this opportunity. The BOB-NTT was the springboard that gave Ehren direction on how to be a better ballplayer, and make use of and improve his talents. We were able to take the the Boys of Baseball evaluations and work suggestions to improve Ehren’s skills and search for the right college programs that would give Ehren the best opportunity to pursue his dream. It was a great thrill to see him take the mound wearing a Chicago White Sox uniform last night, and I couldn’t help but think of all the people who helped make this dream come true. The BOYS OF BASEBALL - NATIONAL TRAVEL TEAM is right at the top of the list. Words can't even begin to describe the unbelievable week we had at Cooperstown Dreams Park. We just arrived home today and already Jacob "Beefcakes" Brown (Hawesville, KY) called to see if Josh had fun at the Mets game, and Coach Brad called to make sure we got home safely. The boys, their families, and our coaches are second to none and Josh continues to have unbelievable BOYS OF BASEBALL - NATIONAL TRAVEL TEAM experiences. He continues to make lifelong friendships and he continues to play amazing baseball. We thought Gainesville was great (last December), but our week in Cooperstown (July 20-27, 2007) was truly unforgettable. We thank you from the bottom of our hearts for giving Josh the opportunity to play for the BOB-NTT. Josh told me that he wished he could play for Coach John Starling, Coach Brad McNew and Coach Scott "Bubba" Luke on a daily basis, and that if any of them ever needed him, he would hop on a plane and play for them any where, any time. He is already looking forward to Gainesville in December. Steve, I find it truly amazing that a group of boys who have never met before can come together like they did in Cooperstown and end up 17th out of 96 teams. They played like they had been together since they were 8 years old. It is a reflection on you and on every boys of baseball coach and family that you put together. If we can ever do anything to help promote BOB-NTT down here in Miami and South Florida, please let us know. Thanks again for everything and we look forward to seeing you soon. "I really just want you to know that they (Logan and Jacob) still always hold dear the things you and your fellow coaches have taught them over the years about baseball and life. They both use your sayings on and off the fields. It is such a nice thing when I hear them talk to the other kids about the things they have learned through the BOYS OF BASEBALL - NATIONAL TRAVEL TEAM experiences (games, tournaments, and instructional activities). Thank you again for everything...you will always hold a special place in our hearts." I am Michael Sterk's Mother. I wanted to write to you to thank you for your terrific support of Michael in his baseball endeavors. Competing with the BOYS OF BASEBALL - NATIONAL TRAVEL TEAM in the Tennessee Fall Baseball Classics in 2003 and 2004 were wonderful experiences for Michael that provided him with a great boost to his self-esteem. As you know, coach, so much of the game of baseball is mental, especially for a pitcher. Michael tried to walk on the University of Illinois varsity baseball team last year, but he was not successful. 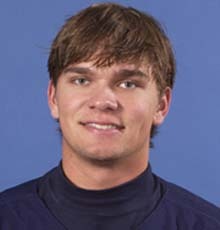 So, he devoted himself to Illinois Club Baseball in the spring 2006, and continued to work out and prepare himself for varsity tryouts in the fall 2006. Your continued support was very important to Michael, and my husband and I believe it made a difference to Michael as he prepared for the tryouts this fall. Your telephone call congratulating Michael on his achievement (making the 2007 Illini Baseball Team as a pitcher), and your e-mail to fellow BOB-NTT coaches Jimmy Kolaitis and Terry Jinks meant more to Michael than you will ever know. As Michael's Mother, you touched my heart and I will be forever grateful to you. 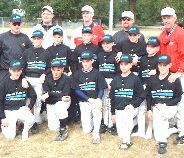 It seems like it was just yesterday when our family was at Cooperstown Dreams Park with the BOYS OF BASEBALL - NATIONAL TRAVEL TEAM week #4, 2006, even though it is now October. We often speak of the fun times we had there and all of the great families we got to know. Nick really liked his teammates and his coaches, and he learned alot about himself, his abilities and especially how to work hard, work together as a team, and to trust his teammates. I have seen a difference in his attitude about how to live his live and what is important to him--his family, friendships, being a positive person, and working hard every day to be the best he can be. I just want to thank you again for the great opportunity you gave Nick and our family with the invitation to play at Cooperstown Dreams Park. When we first attended the baseball instructional weekend in Champaign, Illinois in late July 2005, I believe it is one of the most important things we did for our son. The positive energy and messages you deliver to the players have a huge impact on their minds and their lives. I have seen your influence on Nick's life in many ways. He is becoming a good role model in school, and a hard-working 8th grader. God Bless You, the BOB-NTT, and the Cosgrove Family. "We can't thank you enough for providing Jake Faraci with the opportunity of playing on your '06 CDP week #4 Cooperstown Dreams Park team. It was an extraordinary experience for all of us. Each twelve year on the team showed an incredible amount of team spirit, character, unselfishness, and talent. Every single family and coach of these fine young fellows was incredibly special in so many ways. Having a true love for baseball no matter where on the map "homeplate" is for each one reveals that baseball could be a four season sport all over our country for those who choose this as an option. The concept that everyone eats, sleeps, and plays baseball back home is what connected us all from the beginning. However, alone this would not become the connection that would allow us to create life-time relationships. Instead, it is the empathy, compassion, and dedication towards not only the game but others that would clearly help us to determine that we want these friendships to last forever. These are the type of people that no matter where they live...we would want to be a part of their lives. It is an incredible concept: meeting people and getting to know them for just seven days...and wanting to keep these relationships ongoing. Everything you said regarding the kind of families we would be meeting all came true. Of course...regarding the families we knew already...we will continue to build on these friendships as well. The greatest friendships are created through the BOYS OF BASEBALL - NATIONAL TRAVEL TEAM! Leaving everyone on Friday was one of the saddest moments of our lives. We hope to not only keep in touch, but that many would consider staying with us upon visiting New York for a baseball (or non-baseball) related trip. We completely realize how fortunate it was to have had you, Coach Scott "Bubba" Luke, and Coach Bert "Chili Cheesedog" Farris all coaching Jake in baseball and life-lessons during the week. All of your baseball expertise in addition to your professionalism have enhanced the words, "Play Ball". You have all had a tremendous impact on our son's life. As you had predicted, the coaches had all reached for Jake's hand and touched his heart. One important life lesson provided by Coach Bert was "T-R-U-S-T...Keep trusting your teammates; have confidence." Another important quote by Coach Bert which stands out in our minds applying to school, baseball, and life..."This is real". You were 100% right regarding Coach Scott...Each and every single time he opens up his mouth he is putting on a clinic. The unique way he is regarding players, their families, and baseball as a "life-style" should have earned him a bronze plack in the National Baseball Hall of Fame and Museum. To so many of us, he is a hero...and one amazing "Mentor". We need a Coach Scott "Bubba" Luke bobble head! Coach Steve, all of the contributions you made to the team could not possibly go unnoticed either. It is no wonder at all that the BOYS OF BASEBALL - NATIONAL TRAVEL TEAM is as highly regarded as it is. As parents and educators, we could truly appreciate the standards you set and expect from the players. We love how you consider baseball to be a celebration of life, how you teach our children to not allow anyone to steal their dreams, and how you encourage them to work hard in school no matter what obstacles come their way. You are always making it crystal clear that to play ball later on in life they must set themselves up now by practicing, practicing, and when they think they have had enough...practicing some more. The work ethic and attitude they have in school and on the playing field will travel with them and prepare every single one of them for what perhaps may be ahead: dreams, wishes, and opportunities. Of course, another quote that you have instilled upon us: " You don't get there by wishing...you get there by doing!" As David Cone has said, "We weren't Ruth, Gehrig, and Dimaggio---but this is the ultimate team." We will always have a place in our hearts for all of the coaches, players, and families of '06 CDP week #4 with the BOB-NTT. It was not only a pleasure getting to know everyone...but an honor. Thank you again for making this all possible. We will never forget what was one of the most special times in our lives. What a dream!" "I just wanted to take the opportunity to thank you for a great weekend in Gainesville, FL with the BOYS OF BASEBALL - NATIONAL TRAVEL TEAM. It was a pleasure to meet all 10 players and their parents. All of our players did very well, and it was a joy to watch them play and get better each game. I would also like to thank you for pairing me up with John Starling (TN) and Jim Herron (PA) as fellow coaches. They are class guys and did a great job to make it one of the most fun and enjoyable weekends of baseball. Tripp had a great time and really enjoyed meeting his new friends from Pennsylvania, New York, and Tennessee. He is already asking when he can do this again. Thanks again, and best wishes to all." "Thank you so very much for inviting our son Jake Faraci to play in the Gainesville Winter Invitational Tournament, and for inviting Mark to help coach on the 12 South squad, along with Coach Bert Ferris (OH) and Coach Tim Wentling (IL) this past weekend. It was one of the most fun weekends our family has ever had. In fact, we felt as though we spent it with our extended family (The Boys of Baseball-National Travel Team players and their families). The kids had an opportunity to be with kids they know and bond with kids they just met from all over the country. It is amazing that the organization that we all represent really has such good people involved in it. The morals and values of these families are similiar to our very own. All of the parents we met through the BOB-NTT agree that molding our boys to become good people comes first; hard work in school, and preparation on and off the field creates real baseball players. Steve, your organizational skills, ability to coach and motivate our children, and character building strategies never stop amazing us. We appreciate and support your effort in developing a better world at large through the game of baseball. The children who are able to go through your program are most definitely going to become leaders in our society in later years. The hard work and great effort that went into putting this tournament together is completely impressive to us. Please know how very much we appreciate your time and hard work. You are continually presenting our children with opportunities to become better citizens, teammates, and role models by giving them these and other kinds of experiences. No matter what happens down the road with either of our own children...Jake and Nicole will always remember the baseball and life-lessons you have given them. We have actually weave your philosophy and great lines into our daily lives in our Long Island home. Coach Steve, of course, we thank you for your effort in this particular tournament. It was outstanding in every possible way. We also recognize that the 50+ instructional schools offered each year, plus the numerous tournaments planned over the past 10 years takes a lot of work, time, and an entire heart that touches all of the children involved. We appreciate you and everyone who helps out so very much. Please know that even when we are not with you, you are always with us. Ha, ha...sound familiar? Anyway, thanks so much. Mark and I love the kids on the 12 South team, but, we also admire all of the players and their families on all 11 other Boys of Baseball age-group teams down there for their dedication and enthusiasm. Everyone coming together as one big family in Florida (as we have told you a couple of weeks ago) has given us a second Thanksgiving weekend. In so many ways and with a few tears of joy, we have so much admiration for what you are promoting. Thank you so very much. Baseball players are certainly made in the off-season!" "TJ, T-Bone, Alex, and our families have all arrived home safely here in the midwest. We all had a great time in Gainesville, FL. TJ says, "Thanks, Coach Cosgrove" with a big smile. TJ really liked the kids on the team, and felt like they really fit well with each other. The weekend was well organized...many thanks to you for that. Thanks also for including me as a coach, and especially with Mark Faraci (NY) and Bert Ferris (OH). What great guys! I learned from both of them, and I realize that their brains and hearts are in the right place--helping kids. Bert and I are already planning on getting our teams together, possibly the day after your instructional weekend in Champaign this coming spring. I want to try something with Mark and Jake, as well. Thanks again for all you did this weekend for us, and thanks for all you and the BOB-NTT do for kids." "I don't know how to say thank you, or what exactly I want to say, so I will just let my fingers just do the talking. When Chad and I decided to bring the boys to Nashville, TN in early March, 2004 (for our first instructional activity), we had no clue of the outcome that that trip would have. It was probably one of our best decisions we have ever made together for our boys and our family. I wouldn't change anything...you and the BOYS OF BASEBALL - NATIONAL TRAVEL TEAM have touch our hearts and minds. These have been such wonderful experiences for our family. Everyday, people make new acquaintances, but it isn't everyday you meet new friends. When BOB-NTT comes together for whatever reason, (a baseball day of instruction or a tournament), you meet new friends: friends whom you can really count on, and friends that make you still feel good about this world. I don't know if you really know how much we love and appreciate you and the BOB-NTT family. If it weren't for you and other BOB-NTT family members, it wouldn't have been possible for our boys to participate and experience the game of baseball like they do. Our family just counts down to the next time we will meet up again with all of our friends from the BOB-NTT. At home, we deal with a lot of organizational nonsense. So, when we are with the BOB-NTT program for any reason, it is like a breath of fresh air. Tears fill my eyes when I think of all that we as a family have experienced through BOB-NTT. I know that Logan and Jacob have taken a lot from these experiences. Logan is writing about you, Steve, for his 7th grade portfolio...Jacob has already used you and the BOB-NTT program in several school pieces. When they use things they have learned through BOB-NTT, that tells me we have done the right thing with being involved with you, BOB-NTT, and the many fine families. When Jacob has been on the field playing ball with his other teams, I have heard him tell his teammates, "guy's, we aren't going to get this win by wishing, we got to just win it...we get there by doing!" You know, we haven't been able to get other families where we live to get involved, and it hasn't been for the lack of trying. It is just their loss for not wanting their kids to experience chances of a lifetime. All I know is The Kentucky Browns are grateful for the BOB-NTT, its coaches (Jimmy Kolaitis, Coleman Cosgrove, Johnny Ray, Mark Struss, et al. ), and you, Steve. Every coach, player, or family member we have met are top of the line...people who love the game, but still respect how they got there and who is to be thanked for it (THE GOOD LORD). We have had many great times, and we hope to have many more with the BOB-NTT. Evan's mom (Melissa from Hingham, MA) sent me the pictures she took. I didn't know I was in any of them...she had captured me with a smile on my face when you Lou Presutti were talking to the kids. I was glad to see that, and it's like you can see my real joy that I feel when around BOB-NTT activities and its people. I really don't know what else to say. I could ramble on forever about the BOB-NTT. I am so proud to be a BOB-NTT team mom. Thank you for all that you have done for our family...along with whomever else who has helped us that we might not know about. May God bless and continue to shine down on BOB-NTT." 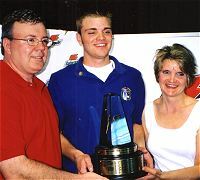 "I just received a telephone call acknowledging that Cole has been selected as a Puma Baseball All-American for 2006. With this selection, Cole has been invited to participate in a five-game series at the Kino Sports Complex in Tucson, AZ on January 13-15, 2006. Steve, I want you to know that Cole would not be the wonderful young man or the baseball player that he is today if it were not for the BOYS OF BASEBALL - NATIONAL TRAVEL TEAM. Your organization has allowed him the opportunity to participate in several fundamentally sound baseball schools, and showcase his talents at numerous national level tournaments. My family still has vivid and fond memories of Cole being 11 years old, and playing in the CABA World Series in Tarkio, MO for the BOB-NTT. Thanks for everything." "Our grandson, Hunter Mozingo, attended your three-day BOYS OF BASEBALL - NATIONAL TRAVEL TEAM ANNUAL SUMMER Baseball School in Auburn this week. Since you live here, I assume you have seen his photo in the sports section of Saturday's O-A News. I wish you could have heard Hunter each evening when he talked to his Dad about the daily baseball learning activities. You would be surprised at how much he learned! He told his Dad that Coach Cosgrove wanted him to continue to participate with the instructional opportunities, and, later on, with the age-group baseball tournaments. Thanks for caring about the kids the way you and your BOB-NTT instructors (Jimmy Kolaitis, Stephen Hines, Chandler Guy, Tucker Carl) do." "Thank you again for inviting us to Florida! We had a great time. It was an incredible feeling to be surrounded by good people who weren't afraid of opening up their hearts to everyone. To coach from the heart is so valuable, yet, is very rare at times. The BOYS OF BASEBALL - NATIONAL TRAVEL TEAM has touched our hearts, and I know Ryan was inspired and grateful to have had this opportunity. We are very thankful that we were able to be a part of the Boys of Baseball. It is an experience we will never forget. You are a wonderful person, Steve, and what you have given to these boys and families will carry on throughout their lives. We wish you and your family a warm and joyous holiday season, and will look forward to seeing you back in Colorado in November, 2005!" "I was on my way to work this morning for the start of a busy week, and I thought of how thankful I am that you have taken the time to create such an activity (BOYS OF BASEBALL - NATIONAL TRAVEL TEAM) that I can enjoy with my son. This upcoming Gainesville, Florida end-of-the-year baseball tournament will allow me to not only get away from the grind of work, but also give me an opportunity to spend quality time with my son. In fact, some of my most treasured time has been by way of events that the BOB-NTT has afforded. Friendships with the BOB-NTT are built for a lifetime with not only great local people like Jody Hillyer and Stephanie Brown, but with many others from all over the continental United States. I would (and will) highly recommend to anyone thinking of taking part in the BOB-NTT to do so. It is a life-changing experience...and, for the better. Chandler, Belva, and I cannot thank you enough. GAINESVILLE HERE WE COME...AND, WE ARE GOING TO HAVE A BLAST!" "Thank you again for an excellent Baseball School & Day of Instruction held yesterday in Luverne, Alabama. Christian always takes away so much from your "Words of Wisdom". Thank you, too, for reinforcing what is so important in all of our lives. Your energy and your faith are an inspiration to us all. It was a very long ride home, but worth every mile! We can't wait to see you again in Gainesville, Florida in December for the end-of-the-year baseball tournament, once again." "You have been a great help to Brandon throughout the years...always positive and encouraging. 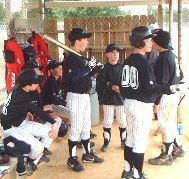 I still have a picture of you and Brandon that was in the Opelika-Auburn News when he was about 5 or 6 years old, and you were still an instructor with Doyle Baseball. Those were great years, and you personally gave him a great foundation to work from. He will always be considered one of your boys...one of the family of the BOYS OF BASEBALL - NATIONAL TRAVEL TEAM. This (recent decision of Brandon's to commit to playing with the Auburn University Baseball Program) is very exciting for us, and we are looking forward to some great years on the Plains, 2005 and beyond. I'll try to get ahold of you sometime soon, when things slow down. I know Brandon would love to talk with you." Thanks again, and STAY BALANCED! Thank your for your kind words. Rob McCaa, Coleman Cosgrove, and Chuck Russell are the perfect coaches to be put in front of these 10 year old kids and their families. It was a pleasure to coach these kids this past week (June 18-25, 2004) at Cooperstown Dreams Park. I hope all the kids and parents had the fun that I had! And, it was amazing to watch Victor Mercogliano grow from last year to this year, not just as a baseball player, but as a person. His hard work at home showed on and off the baseball field. Most importantly, his confidence level has grown also. That is what makes my job so much fun...to watch and encourage kids to grow in life. Your family is always welcome with the BOYS OF BASEBALL - NATIONAL TRAVEL TEAM, and hopefully, I will see you in two years back at Copperstown Dreams Park with the 12 year old group. Good luck the rest of the summer, and all the best to your family! "As I sit here in my office in Boston on Monday, and as I reflect on this past weekend, I think yes, we were once again fortunate with the perfect weather on Friday and Saturday, but more importantly, we were more than lucky to have the gift that you bring to our children, families, and communities. I hope you enjoyed it as much as we did with your second visit to the Boston/Hingham vicinity. I am still awe struck at the energy that you bring to these events. I've studied the concept of "power source - power feeder" in my younger days, and I am amazed now in my "'OLE Elliot" days at how perfectly this dynamic works between you and all who you touch. I know you've been told this before, but you have a great gift in the passion that you bring and for the teaching you do. I've met thousands of coaches, read hundreds of books and attended countless clinics and classes on youth sports and coaching. Some of these were very worthwhile. None of these...NONE OF THESE... at any price, provide what you provide. I'm just glad that your passion includes both baseball and life...and, that somehow you ended up coming to Hingham to share this passion with me, with the entire Hingham baseball community, and with these young players and families. As long as I have anything to do with baseball in Hingham, you will always be welcome. And, I will always do whatever I can to continue to offer these exciting learning opportunities to our players and families, and to pass on to others to do the same, and so in my own way contribute to the BOYS OF BASEBALL - NATIONAL TRAVEL TEAM. I look forward to meeting your son, Coleman, Jimmy Kolaitis, and the other BOB-NTT coaches, players, and families at Cooperstown Dreams Park this coming July (2004)...and, to seeing you again up here in September for our fall BOB-NTT instructional weekend." "It is an absolute honor to receive one of the 2004 ANNUAL COACHES AWARDS from the BOYS OF BASEBALL - NATIONAL TRAVEL TEAM...just to be listed with those other names is something I will cherish forever. I still remember making the video to send along with my application in 1999...playing with the BOB-NTT would ultimately advance my baseball skills and overall understanding of the game. Along with the many age-group tournaments the past six years, you, your fellow coaches, and teammates have taught me not just baseball, but important life lessons. [And, there's nothing better than playing baseball in the dead of winter when you live up North like I do!]. I'm going to miss those morning prayers at the breakfast table and our night-time meetings in the clubhouse (#21 Roberto Clemente) at Cooperstown Dreams Park, the team meetings in the hotel rooms, playing baseball at the various sites, making new friends, and meeting great families. Thank you for making me a better person in life...I will always value my times and memories with the BOB-NTT!" "I hope you and your family had a wonderful holiday season...mine did. I wanted to let the Gainesville tournament sink in before I wrote to you. The Florida tournament was great. I found out I can compete somewhere other than my hometown. I know I have a lot of work to get better, but I'm working on my game. I found a good friend on the team that I'm writing to (Blake Bellman, Wooster, OH). I loved that we learned we can all play more than one position, still have lots of fun, and do well, just like my Dad always says to the players on my hometown team. Thanks coach! Winter is really bad here. I have lots of sports to keep me busy, though. I'm on a travelling basketball team. We practice during the week and play in tournaments on weekends. We're pretty good. I've also been attending a baseball camp at Indiana University of PA. This will go on until baseball season starts. I'm working on bat speed. I have fun doing all of these sports. We have some pictures from Florida that we will send to you soon. Thanks for the great time down there. I'm looking forward to the Annapolis, MD baseball instructional weekend in March, and to Cooperstown Dreams Park this coming summer." "Thank you for the Christmas card and all 10 of the age-group rosters (Blake is going to write his teamates and new BOB-NTT friends from our recent Gainesville, FL time together). We have everything on video. And, as we continue to watch it, words cannot describe the fun that we had with everyone...we are very happy and proud to be a part of your fine organization. I will have several other players/families to bring along to the next BOB-NTT instructional activities that we attend (wherever those are!). I already have a lot of parents asking a lot of questions about the BOYS OF BASEBALL - NATIONAL TRAVEL TEAM (and, about how they can become involved). I know they have visited your website...and, they are very excited to hear about our great initial experience. Take care, and have a safe and Happy New Year." "I just wanted to wish a Merry Christmas to you and your family. I hope to see you, the other coaches, and players with the BOYS OF BASEBALL - NATIONAL TRAVEL TEAM again, so that we can continue to be a part of such a classy organization. Eric hasn't stopped talking about how much he enjoyed playing in the Gainesville, Florida tournament since we returned home. The biggest thing that he noticed was the lack of (negative or self-centered) attitudes on the part of the BOB-NTT players... believe me, it is not like that on too many other teams, and it was a very nice breath of fresh air! You, your fellow coaches, and families have something to be very proud of...thanks again for giving us the opportunity. "Michael and I wanted to thank you for the opportunity to play with the BOYS OF BASEBALL - NATIONAL TRAVEL TEAM in Gainesville, FL...what a great end-of-the-year experience! We both had good time...I enjoyed coaching and Michael had a blast playing. It was also good to reunite and see the families and players again that we met this year (2003) at the various baseball instructional activities, and at Cooperstown Dreams Park through the BOB-NTT. My wife and I commented on how neat it is, not only to see these kids play together on the baseball fields, but also how they interact and hang out with each other off the field (back at the hotel). We look forward to our continued relationship with the BOB-NTT over the coming years. Thanks again for the opportunity to be a part of this organization." "Barry and I appreciate the opportunity extended to Bobby to join the BOYS OF BASEBALL - NATIONAL TRAVEL TEAM at Cooperstown Dreams Park. We are very glad Bobby got this experience, and we feel fortunate to be a part of your organization. Thank you very much for your encouraging Bobby throughout his participation, as we know it was a valuable experience for him." "Thank you for letting me be a part of the BOB-NTT at Cooperstown Dreams Park for the 2003 NATC...I appreciate your inviting me to play with the BOYS OF BASEBALL - NATIONAL TRAVEL TEAM. See you in Gainesville, FL this coming December, and beyond." "How are you? Hope everything is well with you and your family. Looking forward to Gainesville, FL in December. Abe has been working hard at his game this fall. Let me know if you need some more quality players and families, as I may have some who might be available to make the cross-country venture with us...I know that they would like to play with the BOYS OF BASEBALL - NATIONAL TRAVEL TEAM. Thank you for recommending our son Abe for Baseball America's 2004 Baseball For The Ages accolade...it's a great feather in his hat! And, the power of prayer and the direct line to the Man Above are something...soon after your BOB-NTT prayers were offered for those under the recent firey seige here in Southern California, the rains came and put the fires out. You are special in many ways...baseball and otherwise. "I just wanted to thank you for calling us when I lost my Dad (August 29, 2004). It meant so much to me, my Mother, and our family. And, my Mother thought that was so nice that you and the BOYS OF BASEBALL - NATIONAL TRAVEL TEAM prayed for my Father (along with the BOB-NTT PRAYER ALERT) while you all were in Cooperstown. He must have felt like a Hall of Fame Inductee! My Father loved baseball---especially, last year at Cooperstown Dreams Park with the BOB-NTT. When you let his granddaughter (Dominique, #2) play there, I know in his heart, it was a highlight in his life. Thank you so very much from the bottom of my heart. You will always have a friend in me." Forever grateful for your kindness...you will always be in my thoughts. Dear Coach Steve: "I am writing this letter, first to thank you, and secondly, to let you know that the recent Cooperstown Dreams Park (August 15-22, 2003) experience with you, your fellow coaches (Gil, Jody, Bill, and Michael), and the BOYS OF BASEBALL was the very best baseball experience Dominique and the Dinner family have ever had, and she has played a lot of baseball at her young age. We know that you are proud of the BOYS OF BASEBALL - NATIONAL TRAVEL TEAM organization...rightfully so. You all did a great job! You treated my family and daughter with so much love and respect. You are truly a "Class A" act. We learned a lot about baseball that week, and met a lot of great families from all over the United States, including families from here that we also didn't know that well before our time together. Coach Steve, you are truly an amazing person, coach, and teacher...you actually got Dominique to brush her teeth twice a day (and MORE! ), and that in and of itself was a miracle. At our first team "Hello! ", you said it was going to "...be hard to leave that last Friday", and it was for our entire family...you do touch the heart! Dominique hopes to play with you, your coaches, and the BOB-NTT again in the near future...we do too! Please give our best to your family. We hope everything is going well with you all." "Even though we are now miles apart the memories of Cooperstown and all our new friends are never far from our thoughts. It seems as though a day doesn't go by that we don't mention our trip to someone here in Monterey and what a spectacular trip it was. We were so fortunate to have connected with the BOYS OF BASEBALL - NATIONAL TRAVEL TEAM through Gil. Our son Lucas was able to experience the game of Baseball as never before. You were able to show that integrity and character can also be taught on the field not just in the home. We hope that as Lucas moves forward in Baseball/life he will always carry with him your words and actions from that week. We have always believed that as parents you need to surround your children with other role models who share in your beliefs. We were certainly blessed with a wonderful group of men to act as examples for our son. So all that and we had a fabulous time! It was more than we ever expected. Thank you and Coach Jody, Coach Gil, Coach Mike and Coach Bill for everything. We will hold the memories of Cooperstown forever close to our hearts." 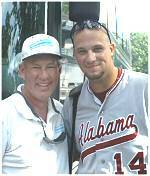 "I want to say thanks for the great time at Cooperstown Dreams Park during the 2003 NATC. I will always remember how true of a professional coach you are. When that one player of yours was going out to play defense in left field, you told him to quit hanging his head for striking out, and then you made the statement that, "I love you, Big Guy! ", it made me just realize what type of person you are. One that teaches discipline and love for one another, that sent a message that I will never forget, and I'm sure that player (and your entire team) won't either. I do want to thank you again for "being professional" when you approached me in the field about the dropped ball in the outfield. Week 11 was my fourth time at Cooperstown Dreams Park, and I go there to umpire to share the fellowship with coaches, players, parents, fellow umpires, and all the rest of the fine people that are involved with the game of baseball. There are truly wonderful people in this world, and I consider you one of them. Well, I hope to hear from you on down the line, so please keep in touch." "I really can't thank you again for the most wonderful week I've ever had, and the opportunity that you afforded our son, Nicholas. Truly the lessons he learned last week (August 15-22, 2003) at Cooperstown Dreams Park, I'm sure will have a tremendous impact on his entire life. It has on ours as parents! Brad and I are just walking around in the afterglow, totally amazed at how that team came together and was so successful after first meeting each other on Friday night, then just the three-hour initial (...and, ONLY!) practice on Saturday morning. We really will never be able to thank you enough." "I just wanted to let you know how much fun I had at Cooperstown Dreams Park weeks #10 & #11, 2003. I learned a lot from you and your outstanding fellow coaches (Gil Ruiz, Jody Hillyer, Michael Guy, Bill Scott, Jimmy Kolaitis, and David Turner). I have learned that The BOYS OF BASEBALL - NATIONAL TRAVEL TEAM always brings out the best in me. When I was in State College, PA and Bristol, CT, at the Little League World Series post-season tournaments in July and August, I still couldn't wait to get to Cooperstown to be with the BOYS OF BASEBALL - NATIONAL TRAVEL TEAM. Playing ball with kids from California, Alabama, Florida, Maryland, and Pennsylvania was really cool. I appreciate all of the opportunities that you have given me, and I love playing on your teams. We'll be at the baseball school in Schwenksville, PA in October, and can't wait to play again for you and the BOB-NTT in Gainesville, FL this winter." "Thanks for the encouraging words. It was gut-wrenching for me to have to tell Elliott he would have to make that tough decision, and I'm proud of the way he handled it. But, then look what happened when I told Steve. He wrote back within an hour that he already had Elliott slotted for the August 20-27, 2004 Cooperstown Dreams Park week any way. How's that for an answer to a prayer? Man...somebody's watching out for Elliott Warford! 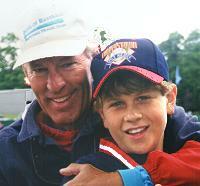 I still say the week with you in Cooperstown (June 13-20, 2003) was the turning point in Elliott's life. In one week, I watched him mature from "wanting" to be a baseball player to "knowing" that he can be. He hasn't backed off one inch since then. He wants to be a coach someday, and he will use you, Coleman Cosgrove, and Coach Steve as his role models, no doubt. Character comes first! God used you and Coleman, Steve, and Lou Presutti (Founder, Cooperstown Dreams Park), but you in particular, Jimmy, to be the right guy at the right time...to be that "one" key person when He was ready to make a difference in Elliott's life. I know I keep saying it over and over again, but you just can't imagine the change that came over him when you trusted and encouraged him and gave him a chance." "The trip to Cooperstown Dreams Park (June 13-20, 2003) would not have been possible for me and my Dad if the BOYS OF BASEBALL - NATIONAL TRAVEL TEAM hadn't opened these new and exciting doors for us. You have both taught me to play top baseball and tough defense...I think that you are both great coaches. Thanks for all of the encouragement and everything that you helped me and my teammates with during the week...I look forward to lots more times with you and with the BOB-NTT in the future." "We would like to thank you very much for inviting our son, John, to Cooperstown Dreams Park (July 4-11, 2003) to play with the BOYS OF BASEBALL - NATIONAL TRAVEL TEAM. Words cannot express the awesome time we all had watching the boys play ball and becoming friends. This new experience for John has enlightened him in a way that we could not have imagined. After being with you, your fellow coaches, Mike Latimer ("Skipper"!) and Bennett Frazier, John came home with an improved outlook on himself and the game of baseball. You have given John the opportunity to express himself through the game of baseball. You taught him how important it is to represent the BOB-NTT, his family, his team, and himself in positive ways. We will never forget this truly great experience you have given our son, John, and our entire Campbell family. It was really neat to get to know 12 other families from all over the country...we are all grateful to you, Steve, and to your organization. We feel truly blessed to have met you, and to have been a part of the BOYS OF BASEBALL - NATIONAL TRAVEL TEAM. We will make every effort to continue attending your Baseball Schools & Days of Instruction in PA, MD, and elsewhere....AND, to staying involved with every opportunity!" "Thank you so much for the invitation to return to Cooperstown Dreams Park for the 2002 NATC...if it were not for school, I/we would definitely be there! I had the best time of my life at Cooperstown, but my favorite was that I had the chance to spend time with you. You are a great coach, and hopefully, a friend for life. Please keep in touch. I always think of what you told us, especially, that "... I am a diamond in the rough!" I hope to hear from you soon...I will play with the BOYS OF BASEBALL - NATIONAL TRAVEL TEAM every opportunity that I can." "Please let me take a minute to express my gratitude to you and to Coach Mike Latimer (The Skipper!). You both gave Alex a gift that no one else could, which is confidence in himself. He puts a smile on my face when he trys to explain to me to have a little more patience with him, because, in your words, "...he is a diamond in the rough!" I do hope that we can always keep in touch, and hopefully in the near future, we can have Alex involved with you and your program again, and for a long time in the future. Again, Steve, thank you very much for thinking about and including Alex. God bless." Thank you for the knowledge and opportunities you have provided for me and so many others. "Just want to take the opportunity to let you know how grateful my wife and I are for the way you handled our son, Josh. He came back home (from the USA BASEBALL Jr. Olympic Championships, Tucson, AZ, June 15-25, 2000) telling us what a great time he had. He said you ran a great organization, and that this was the best "all around team" he had ever been involved with. It sounds like you played against some of the best teams in the country. Your words of encouragement meant a lot to him, too. My only concern was with the message you left on our answering machine. After my wife and I finished listening to that unbelievable, outrageously glowing report, we wondered if you actually had Joshua David Sullivan on your team... surely this isn't that same kid we have to deal with on a daily basis! We can't thank you enough, Steve, and hope Josh has the opportunity to play with you and the BOYS OF BASEBALL - NATIONAL TRAVEL TEAM in the future." "I just wanted to tell you thanks for the opportunity that you gave me with Cooperstown. It was something I will ever forget. It was the time of my life. You are the best coach I have ever had. You also get me to play to my potential. You are also a great life teacher. I hope we can meet again in Gainesville, Florida. Thanks also to all my coaches Coach Jerome, Coach Phil, Coach Gil, Coach Mike, and Coach Gene." "I'm writing to thank you for your generosity in the 2004 ANNUAL COACHES' AWARD. I very much appreciate it. The time spent with you, your fellow coaches, and the teams will always remain very special to me. I was accepted by the BOYS OF BASEBALL - NATIONAL TRAVEL TEAM at a time when I really needed development and experience, and I want to thank you for that opportunity. You open the door to any player in need of guidance and are an example for the game of baseball. I would like to also thank you for bringing me closer to the Lord. I thank Him and my parents everyday for the opportunities they provide me. Like John Wooden once said, "The most important profession in the world is parenting. The second is teaching, and everyone is a teacher to someone." Thanks for being my teacher at a time when I was in need." "I've spoken with Smoot a couple of times, both during the tournament and afterwards. He had a ball, and though I couldn't be there, I feel as if I were. You all have done it again...they all enjoyed a class experience together that everyone will long remember! Best wishes to you, and the BOYS OF BASEBALL - NATIONAL TRAVEL TEAM!" "I just wanted to write and thank you for the profound effect that you have had on my family. After Tucson, the two Smoots came back changed men. The BOYS OF BASEBALL - NATIONAL TRAVEL TEAM really changed them spiritually...and, please thank Coach Terry Jinks for his exceptional messages and lasting impact. It was really neat for me to see how much my son has improved. He really wants to be good. And, I had a great weekend with him, too!" "My name is Caleb Parker and I am 9 years old. I love the Lord and baseball. I know God has blessed me with the talent for baseball and I want to use my talent to the best of my ability. I want to thank you for having this baseball school. I have learned so much that I can use in my baseball games. I believe God has put you in my path for a reason. I want to thank you again." "I would like to thank you for a fun, supportive and positive baseball school. Caleb has thoroughly enjoyed it. You have inspired him tremendously." "I can't say enough how much I appreciate the opportunity (Cooperstown Dreams Park, June 14-21, 2002) afforded Michael and me to be a part of this incredible group of families and the BOYS OF BASEBALL - NATIONAL TRAVEL TEAM. To say that we had the trip of a lifetime barely touches it. Thanks especially to Jimmy Kolaitis, Coleman Cosgrove, and great fellow coaches (Bob Burke, Tom Francis, and Mike Latimer) for helping Michael's dream come true. My bucket of memories runneth over. One, Two, Three...TEAM!!!!" "Thank you very much for a GREAT baseball experience. No one in the world is doing what you have done for kids through the great game of baseball. You have a passion for the game and a loving heart for people. You are a class act and I am very blessed to have been a part of it." "It was great to see you and your team again last week. This year's trip was very different than the past three years that I have attended/brought teams to this particular national level tournament site. A lot of the teams we played showed very poor sportsmanship, and oftentimes the coaching examples were pathetic. You, your fellow coaches, and the BOYS OF BASEBALL - NATIONAL TRAVEL TEAM represent one of the top teams/programs in the country ...setting exemplary standards! What you have done for youth baseball and for the kids/families in your program has made a significant difference in the quality of life for those direct participants (...and others!) throughout our nation. You are changing peoples' lives in a positive way through the game of baseball. Thanks, Steve...keep it going!" "I don't know where to start thanking you for all the opportunities and tips that you have given me. It has truly been a pleasure seeing you and meeting you...our trips to Cuba and to the Dominican Republic were chances of a lifetime! Thanks for being a friend, a coach, and a wonderful person." "Thank you very much for giving Alex a chance to play with your team at the USA BASEBALL Junior Olympic Championships in Jupiter, Florida. We really enjoyed ourselves, and we got to meet a lot of neat people. It was a great experience...a chance of a lifetime." "I want to thank you for letting me be part of your team. I want you to know that I enjoyed myself, learned a lot, and met a lot of good players. It was a great experience for me, and I will always remember the people and players I met along the way." "I wanted to write you a note to thank you for giving me an opportunity to play for the Boys of Baseball in Cooperstown this summer. It was very fun and I had a great time playing baseball there. It was fun sleeping in the dorms with my teammates too. I faced a lot of good pitchers and I learned how to hit against them. It was a good experience playing there and I hope I get the chance to do it again sometime." "Thank you very much for allowing us to participate with the Boys of Baseball in the NATC at Cooperstown. Kyle had a great time! Your upbeat positive spirit and baseball knowledge (Kyle was amazed how much you knew!) made for a great tournament. The entire team was made up of fine young men. Their making the final eight with only nine healthy players is a testament to your coaching skills and their will to compete. I share all your coaching beliefs and hope you do not mind if I pass on a few of your comments with future teams, I may coach." "My son P.J. had a GREAT time with the Boys Of Baseball team in Cooperstown. Those memories will last a lifetime. And I hope that there will be more to come. The camaraderie of all the families was great. My daughter will also have fond memories of the experience since this was a true family gathering. My appreciation to you and the other coaches as well as to Steve." "I signed a letter of intent 4/12/01 for a baseball scholarship to Lenoir-Rhyne College in North Carolina. As of right now LR is ranked 18th in the nation in Div.II. I look forward to seeing Brad Hightower when we play Columbus State. But I just wanted to write you and thank you for giving me the opportunity of playing for the Boys of Baseball in the world series in Homestead, and the fall classic in Tennessee. The opportunity of playing and meeting such a great group of kids each time has been one of the greatest experiences of my baseball career. So I just wanted to say thank you for all that you have done, and what a pleasure it was to be coached by yourself, Phillip Landers, Larry Yancey, and Terry Jinks. Once again thank you." "I've meant to write for the past year to tell you how much you have changed my family's life and the lives of other people you've never even met. Two year ago my husband saw an ad in Baseball Parent for The Boys of Baseball Travel Team. He called and we sent in a tape of our son Patrick. You called us back to say he was able to go to Cooperstown and to buy him a smaller glove. We went to Cooperstown and had a great time. We watched some fabulous baseball, had beautiful weather, DreamsPark has wonderful fields and a great view. So thank you, for seeing something on that tape, for hearing something in my husband's voice. We've had two great vacations because of you and hoping to make it three in row this year." "I want you to know you made a big impact in the life of my son. He often speaks of Coach Cosgrove and remembers many of the Cosgrovisms he learned from you in Cooperstown." "As we approach this Christmas and the end of the year I find great joy in reflecting upon the experience in Cooperstown with you. I am grateful that Almighty God chose you and our family to come together for a week long event that has impressed my son Jordan in such a positive way. Jordan often states how the week spent with you at the Dreamspark has been the highlight of his life, especially his baseball life. We find him quoting many of your quips and recall in particular our last fall baseball game vs a team from San Francisco. SF brought in a fireball closer, much faster than anyone we faced all year. Jordan ripped a triple in the gap in right center. After catching his breath at third, said to me in the coaches box, 'You know Dad, when he showed me his back pocket, I showed him mine, and that made all the difference'. God Bless you, Steve, and your family. May God also look after your Ministry in touching the lives of so many kids and their parents alike. The light within you reflects well in those of us whom you have so graciously touched." "I just wanted to extend my thanks to you for inviting Joseph to participate at the Winter Tournament in Gainesville, and for giving him the opportunity to play baseball during our off-season. He loves playing baseball, and Joe and I enjoy watching the games. I was truly impressed with your motivation and enthusiam. I was especially touched when I saw Coach Bill Ruffin hug Joseph after he pitched on Sunday. Little things like that can make a child feel very important, and it made Joseph feel pleased with himself. Again, thanks for your support of Joseph." "Thank you for all you do to help boys like Bubba have the opportunity to play the game of baseball and learn the skills needed to excel at the game of life. Everytime Bubba has joined the Boys of Baseball team for a trip, tournament, or workout, it has been a positive experience. I can say that he always returns from time spent with you with a smile on his face. In a time when everyone seems to be interested in no one but themselves, you truly help these boys to 'STAY BALANCED'." "We had a wonderful baseball year, and the Schmidt's really want to thank you for all the fun and learning opportunities that you Steve, and the Boys of Baseball players and families have brought us. There sure are a lot of very nice people that we met. We were so impressed with the politeness of all the boys too." "The California boys and I would like to say "thank you" for the wonderful time you offered us in Cooperstown. I spoke with all our parents and boys and we all agree the Dreams Park experience was one of the most positive times of their life. Thanks again for including me in the coaching staff. I had a great time, too." "... would like to thank you for the opportunity to meet you and the Boys of Baseball team. It was a great experience. We like your goals and standards and feel they were met during the weekend of play. It was great meeting the other families and know why you picked their sons for your team. Maybe our paths will cross again. Once again thanks!" "Thank you for this opportunity to play baseball, especially in October. I learned quite a bit. I especially enjoyed meeting you and seeing all of the guys again, the new guys as well. As far as I go with the game of baseball, I will always remember my times and experiences with Boys of Baseball. Thanks again, and I hope to keep in touch with you and Coach Rich Luppino." "I would like to thank you for the wonderful experience you have given to my family and me. My parents and family surely enjoyed watching your games and being "involved." They are all avid baseball fans, and have never experienced this high quality, first-class organization you provided. Linda and I would also like to mention the unique experiences you provided for Jimmy… you hit all the bases… the things he learned and friends he made are priceless and he will never forget it. You and your coaches run a first-class operation, and I am very proud that Jimmy was a part of your team…(I still wear the shirt)!" "I just wanted to thank you again for coaching our son, Joel, at the tournament last weekend in St. Louis. Your closing words, in particular, to all of the players clearly demonstrate what the Boys of Baseball organization is attempting to teach our youth. Thank you for those words of guidance and for reminding the players of the important aspects of life beyond the game they love. I am very proud to see Joel have and opportunity to play for men with this kind of integrity. You walk tall in their eyes." "Thank you for inviting me to be on your team. It was very fun to play at this level. Thank you for giving me opportunities to play a lot. I really enjoy wearing my Boys of Baseball shirts and hats. I am going to work on my game all winter to get ready to play on the big fields next year." "...Keep teaching the youth of America the game of baseball; you're a good ambassador of America and baseball!" "Thank you for remembering me on my birthday. I liked my apples. I'm also using my toothbrush and toothpaste. Thank you for my gum and all that you've done for me. ...Thank you for giving me all the opportunties you've given me to be a good ball player, to become a good citizen, and a member of the Boys of Baseball - National Travel Team. You are really neat!" "[We] are very thankful for the wonderful memories and friends we have made through the years... We certainly include meeting and knowing your family in that group of friends and special experiences. Your kindness and caring nature is most appreciated. You have served as a wonderful coach and positive example..."
"Thank you for inviting me on your Boys of Baseball team to go play in St. Louis. It was a good team with great coaches. I had a lot of fun on your team, especially playing baseball and winning the tournament. You know a lot about baseball, kids, and you have fun doing it. Thanks for letting me be on your team." "Thanks so much for giving Blair and us the opportunity to experience the Cooperstown Dreams Park with your classy Boys of Baseball organization." about their Boys of Baseball experience. "Due to career commitments, including my preparation for the 2005 season, I will likely be unable to join you at the Second Annual Schwenksville (PA) Baseball School (October 9, 2004), and the end-of-season baseball tournaments in Gainesville, Florida. The BOYS OF BASEBALL - NATIONAL TRAVEL TEAM has provided me opportunities that I may not have had, opportunities to learn, grow, and compete. Your friendship and coaching helped me to develop into the player I am today, and the lessons I learned while in a Boys of Baseball uniform guide me off the field, as well. Some of my best moments playing baseball include the many tournaments I competed in with the Boys of Baseball...from St. Louis, to Gainesville, FL, to the two USA BASEBALL Junior Olympic Championships. Perhaps, my fondest memory, however, was that first tournament at Cooperstown Dreams Park (August, 1997), where you gave a skinny kid from Pennsylvania the chance to "show his stuff". What a great team that was! With the help of Jimmy Kolaitis, Coleman Cosgrove, and the many other dedicated and quality coaches and supporters of the program, the Boys of Baseball will continue to provide exciting opportunities to youngsters from across the country. Your baseball schools, coaches' clinics, and tournament teams give every player a chance to learn and improve. I am proud to have worn the BOYS OF BASEBALL - NATIONAL TRAVEL TEAM uniform, and look forward to helping you coach whenever I can. As a token of my appreciation, please accept this $1000 donation to help the program continue its work with kids and families." "I had a great time with Team USA (2001 USA BASEBALL YOUTH NATIONAL TEAM) and we won the Gold Medal! The competition was great and it was just a terrific experience! Thanks again for all your support and all the opportunities you have given me the last five years. I hope I get to play for you a few more times before I'm too old! I'll never forget the last two USA BASEBALL Junior Olympics or that first Cooperstown trip in 1997. Coach Cosgrove, thanks again for your help and all that the BOYS OF BASEBALL - NATIONAL TRAVEL TEAM has done for me. Hope everyone is doing well, and tell everyone I said hi." "Very happy that you and the BOB-NTT families made it home safely! Congratulations on another wonderful run at Cooperstown Dreams Park...once again, a once-in-a-lifetime experience for the entire Lubanski family. Sitting on a bench at Dreams Park last week, we could remember very clearly, and very fondly, the moments that Chris and our family shared with you six years ago. As you know, that first 1997 Cooperstown Dreams Park and BOYS OF BASEBALL - NATIONAL TRAVEL TEAM experience was really the initial step in what would be an amazing and blessed journey for our family...from Dreams Park to the two Junior Olympics (Tucson, AZ and Jupiter, FL), to two summers with USA Baseball (YOUTH NATIONAL TEAM '01, and the JUNIOR NATIONAL TEAM '02), to a Florida State University baseball scholarship, to the 2003 Gatorade National HS Baseball Player of the Year, to the #5 pick in Major League Baseball's 2003 amateur draft. Believe us, when the book is written, the BOB-NTT will be a big part of it, just as it has been in our family's life since 1997. Chris will never forget the times he spent in a Boys of Baseball uniform, and now our younger sons, Mike and Joe, are beginning their own stories with Coach Cosgrove and his excellent cadre of coaches. 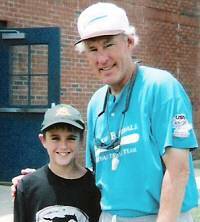 Mike had a tremendous time in Cooperstown, NATC week, 2003, and will use this experience, just like Chris did, to continue developing his potential both on and off the diamond. We are very grateful for the opportunities you gave Mike, and we are quite proud of his contributions to the team's success, especially playing in his big brother's shadow. We, of course, look forward to Gainesville, FL in December and beyond, and Chris, as well, is excited about his continued role with the BOB-NTT overall program in Gainesville, as Coach Chris! Please pass along our best wishes and sincere appreciation to both Coach Jimmy Kolaitis and Coach David Turner for their dedication and efforts on the players' behalf in Cooperstown. Although we didn't get the chance to talk much with David Turner, we know that his son is not only a phenomenal athlete, but a phenomenal young man as well, a true credit to his fine parents, David and Barbara Turner. Regarding Jimmy Kolaitis, let us just say this...he can coach and mentor our sons--including Chris--any time, any place, in any situation, and we hope that Jimmy never hesitates to contact our family if ever, whenever he needs a friend...we will always be there for him. Our sons have learned many lessons having been part of the BOYS OF BASEBALL - NATIONAL TRAVEL TEAM. Of all the lessons learned however, perhaps the one that may guide them the most is about overcoming adversity. As you have noted so many times, it's not how you act when things are going well, but how you act when things are not going your way. Both baseball and life will throw us curveballs, and how we battle through these difficult situations is a definite test of our character, or, as the baseball folks call it, one's "makeup". Our sons are better players and better young men for having learned this lesson, and they will surely be faced with even more challenges as their lives evolve. Their times with the BOB-NTT have helped to shape the foundation that their adult lifes will be built upon." "Team USA (USA BASEBALL Junior National Team 2002) won the Bronze Medal today in the Junior World Tournament, beating Canada 12-3. Chris hit two homers today, and had two hits yesterday in a tough 4-3 semifinal loss to China. Another tremendous experience for him...sometimes, I think we have been overly blessed with all that Chris has achieved. A lot of hard work, determination, and sacrifice...and the BOYS OF BASEBALL - NATIONAL TRAVEL TEAM was there right from the beginning."